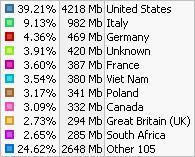 In 2005 more and more readers have come to LENR-CANR from outside the U.S. We cannot track individual users, and we do not use “cookies” or ask readers to register, but we can see that more than half our readers now come from ISPs in other countries. Readers from 177 countries, which is to say, most of the countries registered on the Internet, have downloaded hundreds of thousands of papers. During the four weeks from October 21 through November 18, visitors came from 115 different countries, and 60% of the traffic was outside the U.S. Cold fusion research has been international from the beginning, with vital contributions from India, Italy, France, China, Japan, Russia and many other countries. Regular international conferences provide a forum for the work to be shared and we are delighted to make this information more widely available. We have authors from dozens of countries, and we seek to expand this circle of contributors. We recently uploaded a review by Iyengar et al. describing early research in India, which produced some of the most compelling results ever published. We recently welcomed our first author from Iran, F. Amini. Most of our papers are in English, but we have a small number in other languages, including French, German, Italian, Portuguese and Spanish, and we welcome more contributions in other languages. We are happy to assist and edit papers for authors who are not native speakers of English. We have translated several papers from Japanese into English. LENR-CANR has long maintained a presence in other countries, even places where the Internet is slow and expensive. People in China sometimes have difficulty reaching the U.S., but thousands of them have been able to reach us thanks to Prof. Li, who operates a mirror site copy of LENR-CANR at Tsinghua U., China’s most prestigious technical university. We just added two new papers by Li et al., including our first paper in Chinese, a 1990 Introduction to Cold Fusion, and a technical review, “A Chinese View on Summary of Condensed Matter Nuclear Science,” from the September 2004 issue of Journal of Fusion Energy. The review says that cold fusion is real; it produces tritium, which is proof that the effect is nuclear; and that more funding should be made available for the research. The Journal of Fusion Energy is edited by president of the plasma fusion lobby, Fusion Power Associates in Gathersburg, MD. Heretofore it has been strongly opposed to cold fusion, so we welcome this new open minded support for cold fusion, although it is puzzling that in the same issue of the journal the editor again attacks cold fusion, calling it “controversial and entirely unproved” (p. 161). In these troubled times, it is good to be reminded that science knows no borders, and researchers worldwide are united in their quest to advance knowledge for the benefit of mankind.